I have updated my Peas Pulao Recipe with Step wise pictures. My daughter love it a lot.. Looks so nice ! Delicious and simple.. I make it often as it is my hubby"s favourite. Delightful clicks Akila ! looks wonderful ! Excellent and mouthwatering pulao. Pics look delicious. Pea pulao is one of my 'fix in a jiffy' meal dish. The pulao looks perfectly done. Awesome for rice is my biggest weakness, so I am simply loving this dish. Peas pulao looks super delicious and so perfectly made 🙂 makes me hungry dear !! lovely click and pulao too. Simply mouthwatering and delicious looking pulao. Each grain looks so distinct. Wonderfully prepared. 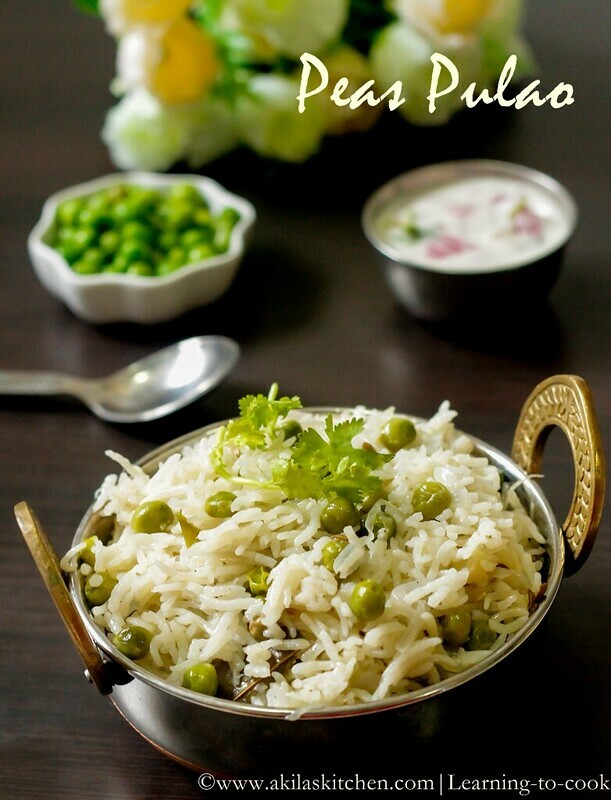 Delicious and inviting peas pulao. Beautiful click. "My Monthly Event – Spotlight: Festive Treats "
delicious pulav with tempting clicks…. Fantastic pulao, very catchy click..lovely! !